This is a heavy-duty line 10 inch diameter winder that will handle (10 inch Winder 100lb x 1000ft)(8.50in 100lb x 500ft ) of line. Heavy duty molded ABS plastic with stainless steel ball bearings make for smooth tangle free winding. The 21 inch retrieval rate per turn on the 10 inch , 17 inch per turn retrieval rate on 8.50 inch and 10 inch per turn retrieval rate on the 6.50. Each with a special design line guide makes taking in line a breeze. The turning knob locks down when not in use and keeps the line neat and tangle free. A must have for the kite enthusiasts. You can find winders like these online for $30.00 for the 10 inch and $27.00 for the 8 inch. We Purchase these winders direct from China with no middleman or wholesaler. We also carry a full line of replacement parts. Please do not use the these winder to take down kites larger than 7 ft. and larger wingspan. The Walk down methord is recommended, then use the winder for speedy line recovery. The old winder (blue) contains the wrapping steel ball bearings. The new winder (white) contains 4 or more ball bearing assemblies that provide longer life and smooth retrieval. 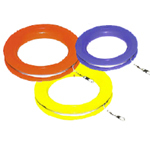 The Halo or Yo Yo winder can be laid flat on the ground to let the line pay off the slanted side easily. This makes the Halo winder the preferred spool for fighter kite pilots. does not include line. Available in assorted colors. Mini Spool is ideal for little hands and indoor flying. Continous lengths of high quality twisted nylon or Braided Polyester flying line for single line kites. On durable Flight Spool. Ideal for small hands. 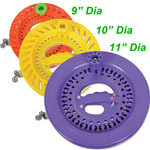 Each spool includes appropriate weight swivel clip for easy and quick flight prep and pack-up. The Speedy Winder is an excellent reel device especially made for kite flying and includes some very useful features. Molded from high-impact ABS plastic, these reels have built-in ball bearing steel raceways for smooth low-friction operation. A pivoting heavy gauge steel line guide helps keep retrievals swift and tangle-free. Comfortable grip and large handle is a joy to use and an integrated 'dead bolt' locking mechanism allows for relaxed and secure parking at any altitude. By X-Kites WindNSun line this winder is available in assorted colors: red, green, and blue. Continous lengths of high quality nylon flying line for single line kites. On durable Stake Winder. Available in 300 ft and 500 ft.